Allen H. Meyers was born in Allenhurst, New Jersey on September 4, 1908. He was a graduate mechanical engineer. He apprenticed with pioneer aircraft builders such as Chance Vought, Glenn Martin and Stinson Aircraft. Al's first design was the OTW, then the 125-145, and finally the 200 series. 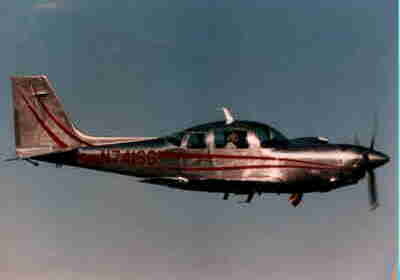 Al Meyers designed the Meyers 200 at least 10 years after, but to compete with, the Beechcraft Bonanza. The Meyers 200, Meyers 200A, Meyers 200B, Meyers 200C and Meyers 200D have an excellent maintenance and safety record. 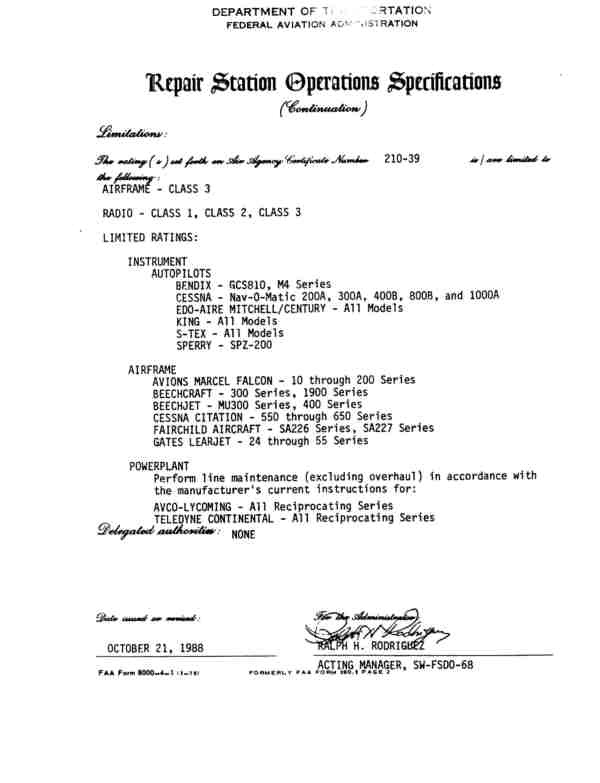 While the exact Al Meyers production of 200 series is unknown, an October 1999 search of the FAA records reveals that there are registered: 1 200 built in 1953, 8 200A's built in 1959-1960, 13 200B's built in 1961-1963, 7 200C's built in 1963 and 4 200D's built in 1964-1965. North American Rockwell's Aero Commander Division purchased the design from Mr. Meyers in 1965 and, in 1966-1967, produced some 83 aircraft (SN 301-383) known as the Aero Commander 200D. This Aircraft established several long standing speed records and was widely regarded as one of the strongest airframes in general aviation. 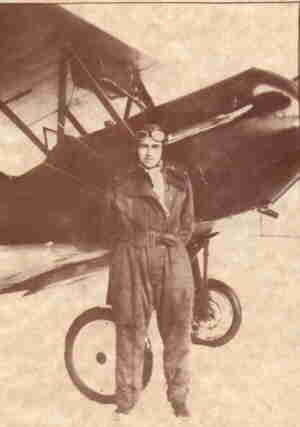 Al Meyers beside a WACO-10, an early 1930's airplane in which he learned to fly. 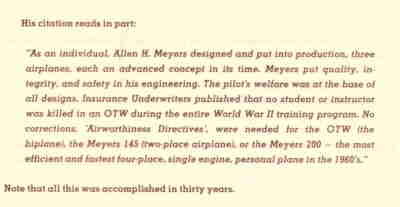 Meyer's first design, the OTW (Out to Win) certified in 1939 and was the first of two aircraft approved for the Civilian Pilot Training Program prior to WWII. Meyer's second design, the all-metal MAC-145. 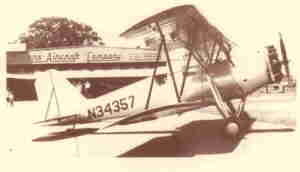 A 2-place, retractable main gear tail-dragger with a steerable tailwheel. About 22 of these were produced in the early 1950's in Tecumseh, Michigan. This aircraft formed the basis for his most famous design, the 200. "...the best airplane ever built..."
In 1974, Al was elected to the Pioneer Aviation Hall of Fame. The Meyers 200 series aircraft have never had a FAA mandated Airworthiness Directive (AD) issued against their airframe, something no other aircraft can claim. It was, and still is, regarded as perhaps the finest single engine production aircraft ever built. There are currently 102 Meyers 200 type aircraft registered in the U.S. today. 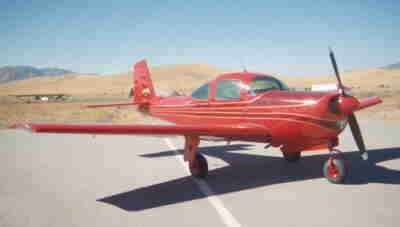 The Meyers 200D set many speed records during the 1960's. Peter Gluckman set a class around the world record with a Meyers 200D equipped with auxiliary fuel tanks. Jerry Mock, a Columbus, Ohio, homemaker, set several records in Women's racing in the Meyers 200D. She piloted a 200D to a new world speed record for 500 kilometers in Class C-1b. Her average speed of 203.858 mph broke the ten year old record of 178 mph set by a Czech racing plane. 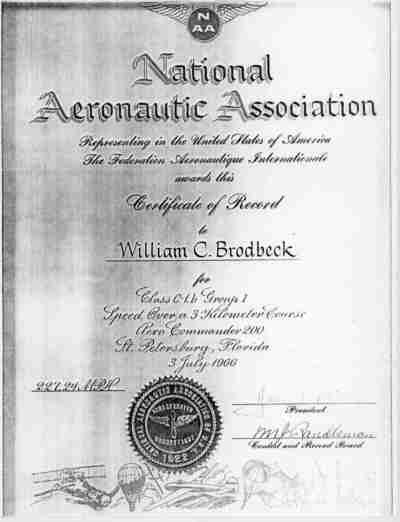 Bill Brodbeck set a National Aeronautic Association (NAA) speed record of 227.24 mph in Class C-1b over a 3 km course which stood for almost eighteen years. Bill also set a Federation Aeronautique Internacional (FAI) World record of 365.700 kmh. Then Don Washburn, flying a standard production 200D, claimed a record of 239.5 mph (208.26 kts!!) in class C-1c over a 3 km course. The Meyers is the fastest, normally-aspirated (non-turbocharged) production piston single engine plane ever built. The Meyers 200D is faster than even the fabled Piper Comanche 400 which has 400 horsepower. Many magazine articles have been written about the Meyers 200D. The Meyers 200D has never had an in-flight structural failure and has never had a FAA mandated Airworthiness Directive (AD) issued against the airframe. The 4130 chrome-moly steel tubular roll cage and understructure act like a race car protective cage during a crash. Several Meyers aircraft have been forced down in the trees and off airport runways with documented instances of the occupants walking away with only minor injuries or a broken bone. 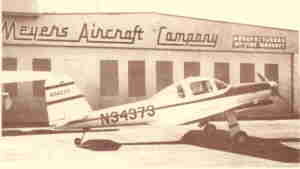 The North American Rockwell Corporation (now Rockwell International), through its Aero Commander Division, was attempting to build a large aviation conglomerate. Rockwell approached Al Meyers to purchase the Meyers 145 and Meyers 200D Type Certificates. They reached an agreement and consummated the transaction. The Meyers aircraft were basically hand built from the very beginning. The rudimentary jigs and fixtures that existed were actually hung from rafters in their small facility, consisting of maybe 10,000 square feet. 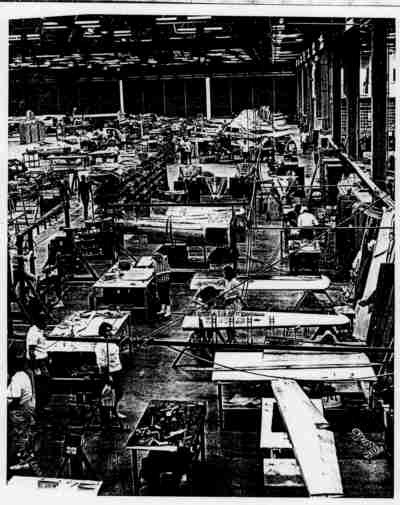 When no aircraft was in production, the jigs were pulled up into the rafters and the workers were busy repairing aircraft. When Meyers received an order, the jigs were lowered and the plant went into production. A very small number of highly skilled craftsmen, many of whom had been with Al Meyers from the beginning, hand constructed each aircraft. Hard production tooling, the kind that allows semiskilled workers to build aircraft, simply did not exist. The only tooling that did exist were some wooden and cardboard templates hanging on the walls, the simple final positioning jigs and fixtures and the hand notebooks of the workers involved. These workers had built various parts of the aircraft for years; thus little tooling was really needed to turn out a completed aircraft. Since no production tooling existed, Rockwell had to create all of the tooling that Meyers Aircraft now possesses, virtually from scratch. Paul Nichols, the production test pilot for Rockwell's Albany Division and who now works for Ayers Aircraft, who purchased the facility from Rockwell, has advised he has seen reports to Aero Commander's Corporate Headquarters indicating that it was taking over 10,000 man hours to build each Meyers 200D. Analyzing other industry reported averages, it is now known that the man hours should have been in the range of 2000 to 2500 hours. It seems clear the Rockwell plant personnel were including the hours necessary to create all of the non-existent tooling in the hours they were reporting for each aircraft. Rockwell Corporate decided that it could never make a profit with an aircraft that took 10,000 hours to build so it decided to turn its design team loose on a single engine project that it hoped would be easy to produce. Thus was born the Commander 112. The Commander 112 turned into the 114B which remains in limited production in Norman, Oklahoma. Management has spent considerable time and effort reconstructing the events that lead up to this decision by Rockwell to cease production of the Meyers 200D. The 112 was a far inferior aircraft and very slow compared to the Meyers 200D. It has also had numerous severe Airworthiness Directives (ADs) issued against key structural components that have even grounded the entire fleet. Paul Whetstone has compared the manufacturing time against industry reported times and the DAPCA IV Development Cost and Production Model. (For a detailed section on the DAPCA IV Click Here) The high end is around 3,000 hours and through production familiarization, goes down to below 2,000 hours. It is now quite evident that the 10,000 hours reported to Rockwell Corporate were mis-categorized, causing it to make one of the great misguided decisions in light aircraft production history. Because of Rockwell's mistake, Meyers Aircraft now has the opportunity to produce and market the "...best Airplane Ever Built...", sell it for more than $100,000 below the competition, and yet maintain an industry standard profit. 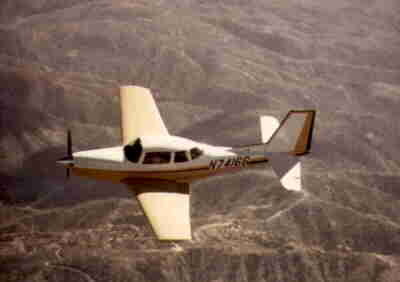 During the time that Rockwell was deciding to stop production of the Aero Commander (Meyers) 200D, they were approached by Lymon Lyon of Detroit. Lyon had dual degrees, one in mechanical engineering and the other in law. Lyon had flown behind turboprop power in the military and decided that he wanted a personal turboprop. He researched the market and decided that the Aero Commander (Meyers) 200D had the strongest airframe in production and approached Aero Commander to build one for him with a turboprop engine. Aero Commander told him that it was in the process of ceasing production of the Aero Commander (Meyers) 200D and suggested that he purchase the Type Certificate (TC) and do it for himself. Lyon then formed the Interceptor Corporation with a group of physician investors from the Detroit area. They chose Don Long, a senior project engineer with Aero Commander to head up the Company. Long had been responsible for the certification of the Jet Commander. 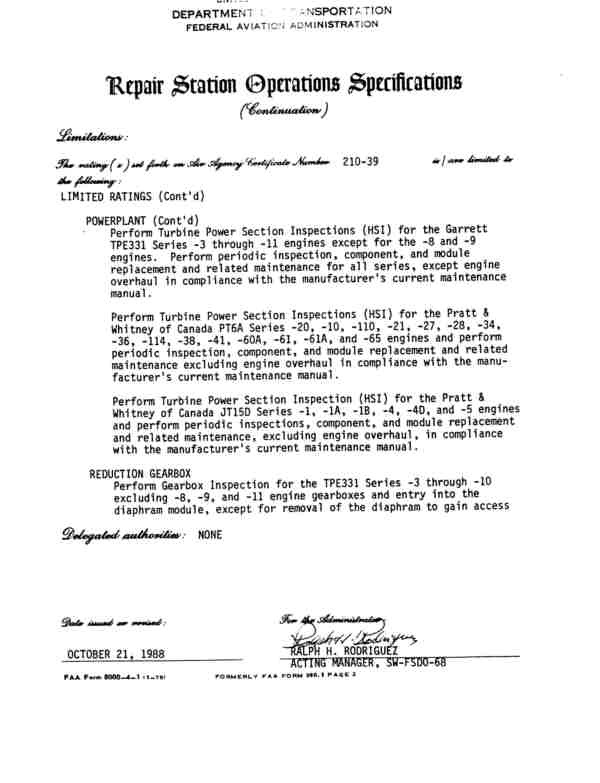 He estimated that it would take six months and $600,000 to certify the turbine engine single. As the "hot" new aircraft of the early seventies, the Interceptor 400 was involved in a 20+ year "great debate" in the aviation industry over which is safer, a single engine aircraft or a light twin engine aircraft. Dozens of articles have been written on this subject. Most of the major manufacturers were pushing for twins because they made more money on a twin than on a single. 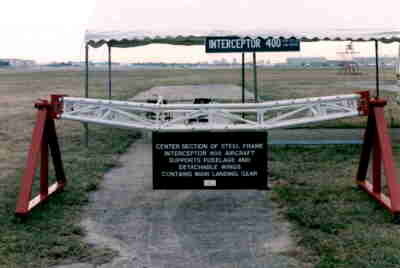 The Interceptor 400, as the first turbine single to be certified in the U.S., was a major factor in the "single" camp. To see the 1973 Air Facts article, "Johnny MacLaren flies the Interceptor 400," Click Here. The decision makers have really been the insurance companies who charge more to insure a $100,000 hull value twin than a $100,000 hull value single. A 1993 quotation from AVEMCO showed that the same hull value Saratoga single would cost $1978 whereas the Seneca twin would cost $2576. When safety is coupled with the vastly greater reliability of the prop-jet engine, the Interceptor 400 is one of the safest aircraft in the sky, as is the piston powered Meyers 200D. Peter Luce has been interested in aviation from many years. He obtained his Private Pilot license in 1947. Mr. Luce is an aviation visionary, recently funding the Amelia Earhart historical expedition in the Pacific. 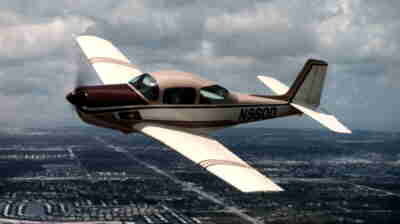 He was able to see the potential of the Interceptor 400 long before the general aviation community recognized the concept. He became a stockholder of the Interceptor Corporation in 1971 and, later, became the Sales Manager for the Company. Mr. Luce loaned money to the Interceptor Corporation, secured by the Meyers 145, Meyers 200 and the Interceptor 400 TC and by the Interceptor 400 aircraft. Unfortunately, the Company was unable to secure production capital on favorable terms. Therefore, when the Interceptor Corporation eventually defaulted on Luce's loan, he took possession of the TC, component parts inventory, tooling and engineering drawings which he stored in the Denver area. Being a prudent businessman, Mr. Luce realized at that time that the market conditions for the Interceptor 400 were not optimum and there were multiple producers of single-engine piston aircraft like the Meyers 200D; therefore, Mr. Luce decided to preserve the assets of the company for a change in market conditions. Today, Mr. Luce owns half of the shares of Prop-Jets, Inc., of Texas. Prop-Jets, Inc. dba Meyers Aircraft, holds Type Certificate #3A18 for the Meyers series of aircraft. (To see the current TC, Click Here) Mr. Luce is in the process of winding down his numerous activities for estate planning purposes. He is avoiding increasing his long-term financial commitments and desires to remain a passive investor. Peter Paul Luce introduced Paul Whetstone, a Ohio native, into the project in 1980. Paul traveled around the country for almost three months talking to as many of the people involved with the Meyers aircraft as possible in a fact finding study prior to determining whether he wished to put his efforts behind this opportunity. He was convinced of the quality and airworthiness of the Meyers 200D and the I400, but the timing for the Interceptor 400 was not yet optimum. Paul is now 50% owner of Prop-Jets, Inc, dba Meyers Aircraft Company and is President and sole Director. Also, at that time, there were many piston singles being produced and general market conditions were declining. Whetstone relocated to San Antonio, Texas, to pursue his aviation career. Paul set out to amass some credentials and experience in the industry and wait for market conditions to improve. He enrolled at Hallmark Aerotech in San Antonio to earn his his Airframe and Powerplant (A&P) Mechanics license. He graduated in September, 1982, and set a new academic record for the school which was unbroken for ten years. Richard Fessler, owner of the school was impressed with Whetstone's grasp of the course content and introduced him to the FAA in San Antonio. The FAA named Paul a Designated Written test Examiner for everything from A&P Mechanics through Airline Transport Pilots (ATP). To see more of Paul's personal credentials and accomplishments. Click Here. About half way through the year-long course (Fall, 1981), Whetstone moved the Interceptor 400 from Colorado to San Antonio. He rebuilt most of the aircraft's systems as he completed the school during which he gained valuable experience on the aircraft as well as put some new knowledge into practice. One of these areas concerned pressurization of the Interceptor 400 which at the time would not attain full pressurization. Paul determined that the door was improperly installed and redesigned the entire door latching mechanisms - over 1000 hours of work on the door alone. Additional work such as engineering, structural steel and sheet metal work was also undertaken by Whetstone. The work was finished in Spring, 1982, and remains in good working order today. 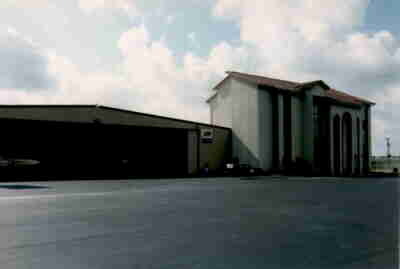 Paul purchased Stinson Aerotronics (SA), San Antonio, in August, 1982, a small shop located on Stinson Field on the south side of town. Initially, SA performed inspections and other general maintenance work. Soon, however, Whetstone decided SA would specialize in avionics installation and repair. His own sub-specialty was autopilot installation and repair. Whetstone Aire, (the former SA renamed) grew rapidly. 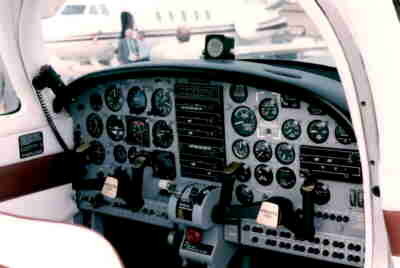 In the fall, 1984, Whetstone fabricated a new instrument panel, installed new avionics and performed various aerodynamic modifications to the Interceptor 400 in preparation for the National Business Aircraft Association ("NBAA") show in Dallas, Texas. Drawings were prepared to eventually certify the changes. The aerodynamic modifications added over 14 knots indicated airspeed. The I400 indicates 203 kts at 24,000 feet. The TAS is 300 kts!! The Interceptor 400 was well received at the NBAA show, however, Beechcraft introduced the Burt Rutan designed Starship as a 7/8 scale flying prototype. The entire industry was going into a composite construction craze. 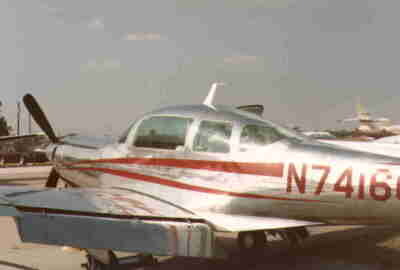 The Mike Smith single-engine Propjet was also introduced with a composite fuselage and a Beechcraft Baron wing. Paul returned to San Antonio from the NBAA show and decided to concentrate his efforts on his rapidly growing avionics business. 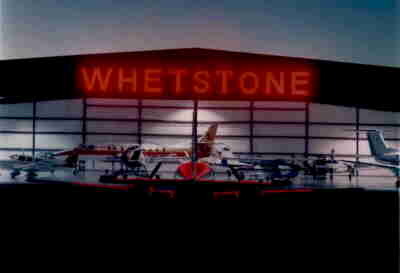 Whetstone opened a satellite shop of SA, called Whetstone Aire at the San Antonio International Airport. Whetstone Aire leased the only suitable location for its business in a facility owned by a Savings and Loan (S&L). The S&L acquired the operating facility through foreclosure. 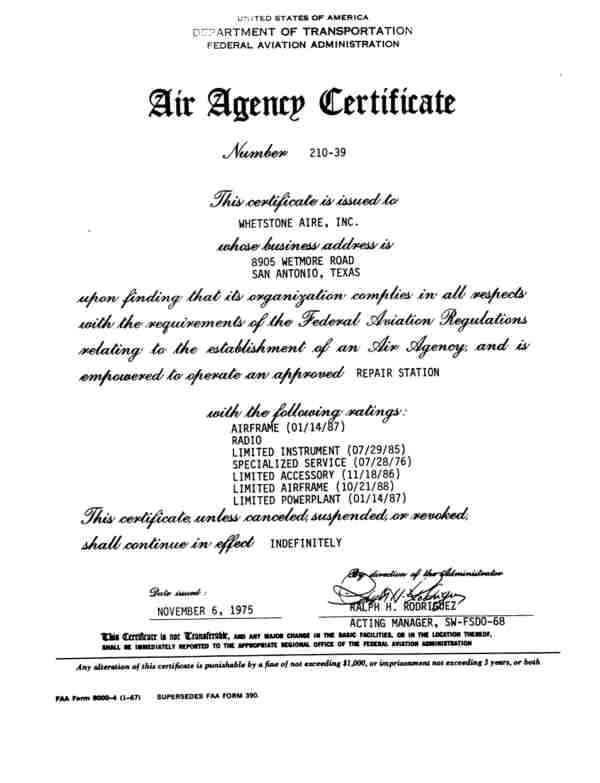 Subsequently, they approached Mr. Whetstone to manage (in addition to Whetstone Aire) the other tenant in the building, which was the San Antonio franchise of MillionAir, a Fixed Base Operation (FBO), headquartered in Dallas. 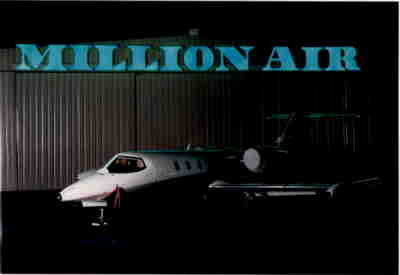 San Antonio MillionAir was losing over $30,000 per month. Reluctantly, he agreed and by the spring, 1988, the entire facility had turned profitable. By mid-summer, business was booming. Unfortunately, the S&L failed and was succeeded by the Resolution Trust Corporation (RTC) who negated his lease and Mr. Whetstone was unable to continue in business at the San Antonio International Airport. Mr. Whetstone then pursued other personal interests. Mr. Luce and Mr. Whetstone continued to maintain the assets of Prop-Jets, in anticipation that market conditions would improve for the future production of either the Interceptor 400 or the Meyers 200D. The assets of both Whetstone Aire and Meyers Aircraft were moved to a 15,000 square feet facility in Bulverde, Texas which is about ten miles north of San Antonio. Whetstone then started to determine the feasibility of producing the Meyers 200D. A test advertisement was taken in Trade-A-Plane in 1992 which resulted in 16 deposits. But the market was still in a downturn, the Statute of Repose had not been passed by Congress and funds were scarce. Even though Whetstone believed the product liability situation had nothing to do with the aviation downturn, others in the industry were blaming their woes on the liability situation. For a more detailed analysis of management's opinion on the market and product liability situation, Click Here. The market bottomed out in 1994, showed slight increases in 1995 and 1996 and then took off in 1997. The time was now right to put the Meyers 200D into production. 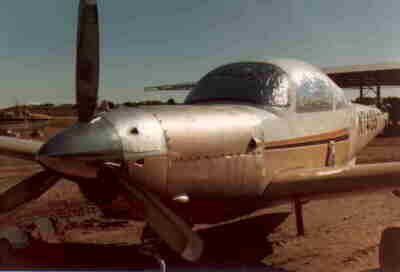 In 1995, Prop-Jets was approached by the Seminole Indian Tribe of Florida, who had purchased the TC for the MAC-145 aircraft, #3A1, about the possibility of its aircraft arm, Estumkeda, Ltd., licensing some technology to upgrade their MAC-145 aircraft (For a link to the current list of FAA Type Certificate holders and other FAA publications Click Here) and licensing the rights to manufacture and distribute the Meyers 200D. Estumkeda requested the right to use the Meyers name and Prop-Jets had agreed, "subject to completion of the licensing agreement." 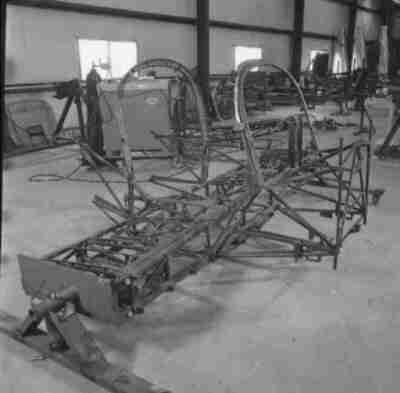 Estumkeda, Ltd now began operations as "The New Meyers Aircraft Company" in Wichita, Kansas. Prop-Jets and Estumkeda were unable to come to final terms for such a licensing agreement. (For a detailed history of the 145, its change of ownership, and the SP20 Click Here). In November, 1996, Prop-Jets secured trade-mark Counsel in Gunn, Lee & Miller, San Antonio, and filed for trademark protection for the Meyers name in the entire U.S. as well as in Texas (Texas has granted the mark to Prop-Jets - the U.S. has confirmed receipt of the filing.) Estumkeda continued to use the Meyers name, including undertaking national advertising, even though Prop-Jets had requested that it cease doing so. In December, 1996, after Estumkeda ignored its warning, the Prop-Jets filed suit in Federal District Court in San Antonio and was granted an immediate Temporary Restraining Order (TRO) with accelerated discovery. The suit was settled eight days after its initial filing. Estumkeda could no longer use the Meyers name and subsequently changed the name to Micco Aviation located in Ft. Pierce, Florida. Their aircraft is called the SP20 and is reported to have received its Type Certificate from the FAA on Wednesday, January 5, 1999, over four years from the original anticipated certification date.